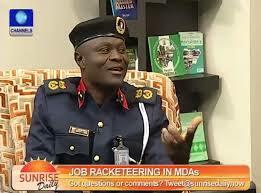 A new jargon has been introduced into the Nigeria social media following the drab response(s) given by the Lagos State Commandant of the Nigeria Security and Civil Defence Corps (NSCDC) during an interview session on Channel TV’s breakfast programme. This argot - my oga at the top- has swiftly spread across social networks and has even become rife in day-to-day conversations in Nigeria. It is really difficult not to see an allusion to this patois when you scroll down your news feed; someone somehow must allude to it in a funny way. However, several versions of blurbs have been created on the image of the fumbled and lame commandant and his image has been depicted in various art of caricatures. The commandant has even become a blockbuster as the jargon spreads. Given the way the transcript of his absurdly ridiculous response(s) spread across social networking mechanisms like a blockbusting novel, one would then wonder why Nigerians don’t engage such tempo in communicating very persistent economic, political, and socio-cultural issues we face in the country. Though the transcript of the interview has gained much attention on social media networks and has to some extent, so to speak, become a happiness generator to some people, I didn’t personally find any course at all to share in that hilarity the first time I saw the video. Frankly, I wasn’t actually chagrined per se because most of the times I have watched or (and) listened a security agent give interview I have never failed to grimace. Haven got a nodding acquaintance with the modus operandi and modus vivendi in the bureaucracy of Nigeria’s security services; it suffices to say that the comic commandant shouldn’t take all the reproach. That interview- otherwise what people regarded as a national disgrace- has got a lot more to say about the regimented mode of operation in Nigeria’s security services. The arrow emanating from such interview- which looked to me like a comic strip session given the man’s appearance and the whole setting in general- points to the fact that the commandant must have been cautioned prior to the interview. He might have responded based on the security conscious brief/orientation he was given prior to the interview by his superior. This is not unusual within the context of regimented lifestyle evident in the operation of security services in Nigeria. And it is not out-of-the-way to argue that the regimented way of life in the Nigeria’s security services may have impacted on the commandant’s response(s). Though this is not an attempt to shield the ignominy exuded by the lame-brained commandant, but at the same time one has to take into account some contingencies that may have affected the his psyche. Too much restriction to what a security officer, irrespective of the office he/she works out of, says when on official duty sometimes could have adverse effect(s) on the personnel, especially in the current era when we have considerable number of security agents who cannot think out of the box. Their responses are often either tied to what they were asked to say or cocooned within the nucleus of image/identity protection. The liberty of a security officer to express him/herself in public the way he/she may deem necessary is often times constricted. Thus it’s only a few smart ones that have the savvy to apply their initiative(s) in some situations. In today’s gospel reading, Luke 15, 1-3, 11-32, Christ revealed to us another of his divine quality that distinguishes him from us humans- the ability to forgive sins and forget. As I was reflecting on the motivation behind the church recognizing today as Rejoice Sunday the message passed across on the parable of the prodigal son became clearer- we rejoice with joy and happiness for God in his infinite mercy has forgiven our sins and accepted us back through Christ’s death on the cross and resurrection. The chunk of this thinking is embedded in the parable of the prodigal son. However, the parable of the prodigal son, like the parable of the fig tree, makes an analogy of a young man wrecked by his thoughtless actions- sin, and his forgiving and merciful father. In this analogy the portrayed son represented us- like the prodigal son we are often caught up in sins engineered by our own actions. Thus the compassionate father represented Christ and his decisions were reflective image of Christ. The message behind the father accepting his languished son back despite the great deal of wealth he had squandered is a clear lesson to us that Christ can accept sinner- even the worst sinner on earth, as long as the sinner is willing to return to him for forgiveness. This lesson then spreads to capture the fact that every soul is important to God and as such he cannot afford to any soul. In this sense God accepts any repentant and remorseful soul with indescribable joy. Thus the sumptuous welcome party and hearty embrace given by the father to his repentant son is a demonstration of the big picture in the resurrection from the dead- a rebirth to new way of life from death- which Christ makes possible to us who believe in him. In the same vein, the analogy makes a contrast of the two sons- the eldest son’s unwelcome and coldly reception to his brother and the sinful son, and the forgiving father’s sumptuous party and hearty embrace for his repentant son. This is a contrast between forgiveness and un-forgiveness. While the father forgave despite his son’s wrongdoings, the eldest son who had not been wronged showed no forgiveness. However, his un-forgiving heart turned him into a vindictive brother, which precipitated some sort of isolation and separation from others. God in his infinite mercy gas given us his compassion and mercy, however; it is left for us to tap into this concession while we strive to answer his call. It can never be too late to get up from where we have fallen short of directions and get back on track. Today’s parable in the gospel has shown us the vivid picture of God and what he can do to bring us back to the rightful state he wants us to be at all times.